This month will see the start of what must be some of the oddest judicial proceedings in what used to be called the free world. Nine political prisoners will be put on trial together, some of them for having helped organise an independence referendum (which was legal or not, depending on whether you defer to Spanish, Catalan or international law); two of them, for having made a speech in front of 40,000 demonstrators and then asking those same demonstrators to disperse; and one of them, Carme Forcadell, the former Speaker in the Catalan parliament, for having allowed a debate (on independence) in that self-same parliament, one of whose principle functions is to house debates. Most of these people have been in jail for several months or over a year, and are accused of violent rebellion, sedition, and misuse of public funds. A tricky business, that mention of violence, given that on October 1, 2017, brute force was all but exclusively used by the Spanish police against voters. Which is why the nominally socialist Spanish foreign minister, Josep Borrell, recently resorted to the time-honoured tradition of his right-wing predecessors: lying through his teeth to the foreign press and the EU (specifically, he said that many images of the gratuitous police violence came from servers in Russia and Venezuela). This was counterbalanced by a detailed recent report compiled by the prestigious doctor and university professor Núria Pujol-Moix, which proved definitively that on Oct 1, the Spanish forces of law and order inflicted wounds on 1,066 people; 68 of those wounded were over 65, of whom 13 were over 79; 1,443 people were beaten with truncheons, punched, kicked, pushed, thrown to the ground or down stairways, dragged by the ears, hair or neck or shot at with rubber bullets (one man lost an eye); 34 people suffered traumatic brain injuries; only 20% of victims were hit on those parts of the body acceptable to police protocol; 80%, on body parts vulnerable to damage. What’s more, the American data analyst Joe Brew has proven that in tweets made on and immediately after Referendum Day, only the pro-indy parties talked about violence (that inflicted by the police); the unionist parties didn’t mention the word violence at all (they naturally wanted to keep mum about the police brutality; but if the voters had been violent, they would have tweeted it from the rooftops). Despite which, it seems that Madrid’s upside down version of events will be the one that foreign governments accept, if a recent incident in the Westminster parliament is anything to go by: last month, Ronnie Cowen MP asked the British minister for Foreign Affairs when he was going to protest about the continued imprisonment of Carme Forcadell. The minister retorted that the UK government would fully support the implementation of the rule of law in ‘democratic’ Spain. Clearly, the minister didn’t realise – who does out there? – that for Madrid, the unity of the state trumps human rights, political rights and, yes, the rule of law itself. If a law can be seen to protect those defending Catalan independence, the Spanish judiciary will simply skip over it. 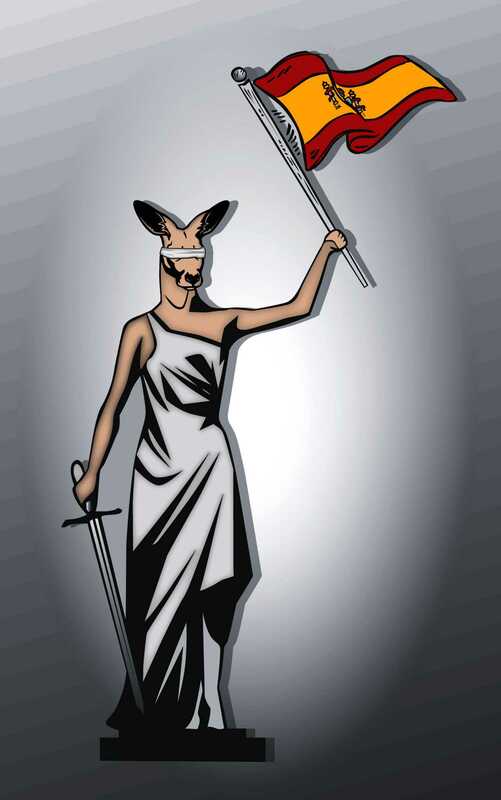 A kangaroo court indeed.